Whether you're a student seeking seasonal employment or a teacher looking for supplemental income, national park summer jobs offer unique ways to make money and enjoy the wonders of the U.S. National Park Service. Since its founding in 1916, the National Park Service has become of the most beloved government employers. There are 391 national parks located in the United States, plus sites in Guam, Puerto Rico and the U.S. Virgin Islands. While you may first think of famous parks such as Mount Rushmore or Yellowstone, there are many other parks throughout the country. The Park Service employs about 16,000 full time workers who take care of the parks throughout the year. They serve as guides, rangers, visitor center interpreters, and more, taking care of myriad tasks from marking trails to keeping people safe. Each summer, about 10,000 part time jobs open up for part time employees. Even though there are many open positions each year, competition for national park summer jobs can be fierce. Seasonal jobs are handled by a group called the Seasonal Recruitment Operations Center of the Park Service. All of the open jobs, both full and part time, are listed on USA Jobs. Once you visit USA Jobs, type in "NPS" to limit your search to job opportunities within the National Park Service. There are many types of jobs available with the National Park Service. For part time work, the most common job openings are for Visitor Use Assistants, Park Guides, Park Rangers, Science Technicians and Maintenance Workers. Visitor Use Assistants: These are the people at the toll stations and payment stations at the entrance to the parks. They monitor incoming and outgoing traffic, provide directions and assistance to motorists, and take payments and fees. You'll need to pass a background check since this position requires handling money. Prior experience operating a cash register and in a retail or customer service environment is a great background for this position. Park Guides: Park Guides are slightly different from Park Rangers. Guides typically work near the main Visitor Center. They give lectures or background talks about the parks, especially in historic parks. They may run the visitor center movies, answer questions about the park, work in the museums at visitor centers and more. They may also work in campground areas and lead talks or short nature walks. 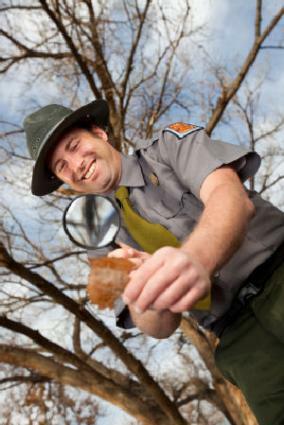 Many Park Guides are history majors or teachers who enjoy sharing and speaking about their interests. Park Rangers: Typically Park Rangers are the people you think of when you think of National Park Service employees. The Park Rangers lead visitors on educational walks and help visitors explore the resources at the park. Rangers also help with public safety and first aid. They may compile statistics, develop programs for the parks, and present information used to monitor and expand park programs. Science Technicians: Science technicians are the behind the scenes people at the National Parks. They collect specimens from nature such as water, animals, soil, and plants to monitor the health of the ecosystems. They may work out in the field or in an office. Some work solely on computers, compiling data and statistics to help the other park employees. If you have a background in biology or other sciences, or you're a student with a science major, this may be an ideal opportunity for you. Maintenance Workers: Like any public facility, the National Parks require a crew to perform routine maintenance. In campgrounds, the maintenance workers may clean the bathrooms, paint or restore picnic tables, and remove garbage. At other parks they may also cut the grass, build or fix outdoor fixtures, clean and remove trash. The maintenance crew members at each park keep the facility beautiful, clean, and comfortable for visitors to enjoy. First, get your resume together before applying for a job at the National Parks. It's smart to look early and often at the job listings on USA Jobs. You can sort by geographic area if you don't want to go far away, or if you're feeling adventurous, you can see job openings throughout the United States. Expect a routine job application, interview, and for some jobs, a background check especially if you will be handling money or working with children.